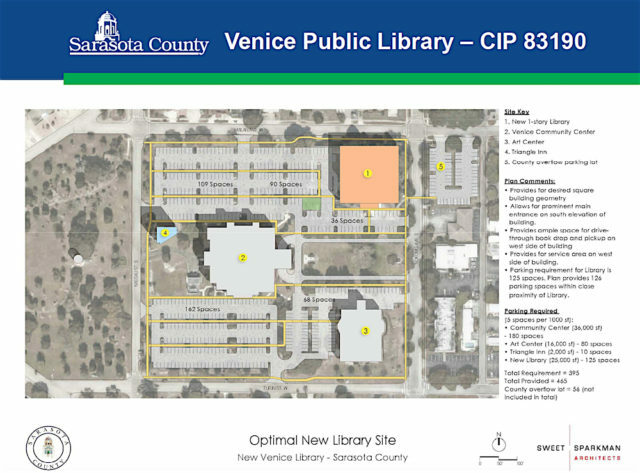 With a unanimous vote on Feb. 15, the Sarasota County Commission approved a $354,360 increase in the budget for the new Venice Public Library, including $216,736 to have the old facility on the Cultural Campus in Venice torn down. 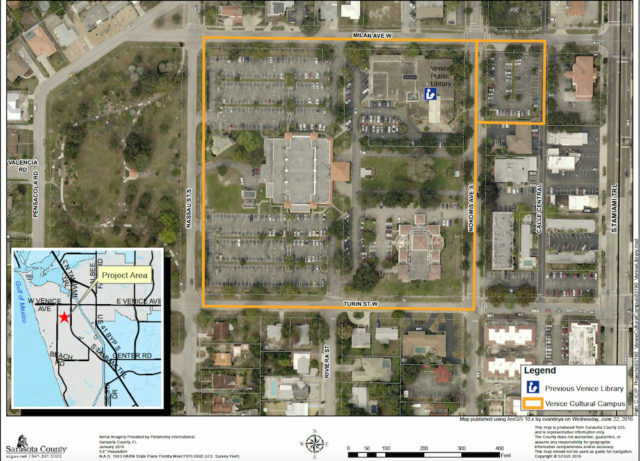 The actual demolition is scheduled to begin in mid-March and be completed by April 27, according to a timeline provided to the board in advance of the meeting. “Afterward, the site will be fenced for protection with an exterior decorative windscreen that will be maintained until construction of the new [library] begins,” a Feb. 15 staff memo says. A resolution the board adopted through its motion explains that the demolition of the existing facility — which was closed at the end of January 2016 — is necessary “to complete site soil investigation and foundation design of the new library structure,” which led to the increased project cost. The County Commission ordered the facility closed out of worries that persistent mold would harm the health of patrons, volunteers and county employees. Concerns were raised in subsequent discussions about whether material in the soil on the site had led to staff’s inability to remediate the mold problem sufficiently to keep the library open. After the Feb. 15 vote, Commissioner Charles Hines said, “I’m very pleased [with] the pace this is staying on and moving forward.” He seconded Commissioner Nancy Detert’s motion for the cost increase and demolition. Both Hines and Detert are Venice residents. County staff held eight meetings with community residents between March 21, 2016 and Dec. 8, 2016 to gain their views on the design of the new library, the staff memo notes. About 450 people attended the sessions to offer comments, the memo adds. 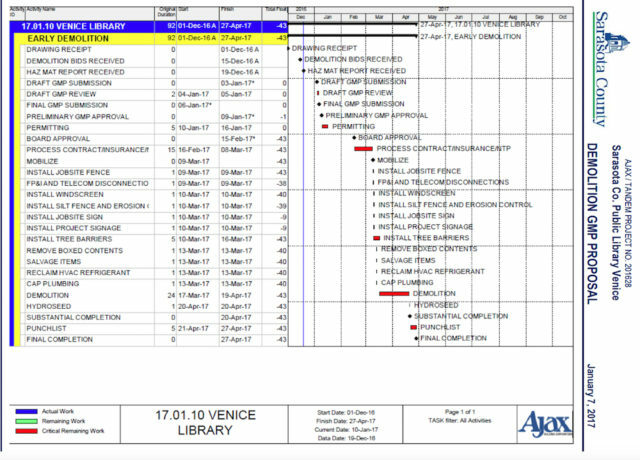 Furthermore, the memo says, a library planning consultant working in association with Sweet Sparkman Architects of Sarasota — the firm designing the new building — conducted 13 focus groups with 142 participants from Aug. 16, 2016 through Aug. 19, 2016. In September 2016, the County Commission awarded a contract for pre-construction services for the new facility to the team of Ajax Building Corp. and P.J. Hayes Inc., which does business as Tandem Construction. The staff memo points out that the County Commission last year identified the replacement of the Venice Public Library as one of its top priorities. The county has been leasing the City of Venice’s Hamilton Building as temporary quarters for the public library until the new facility is ready to open.